Seward took the early lead, but Frank Phillips answered back and held a 6-5 advantage through five innings. The teams traded runs in the sixth and seventh innings with Frank Phillips coming out ahead, holding an 11-9 margin through eight. After the Plainsmen added another run in the top of the ninth for a 12-9 lead, the Saints began their rally in the bottom of the inning. After a walk to Ben Tsui to start things off, Frank Phillips reliever Tanner Bercier seemed to right himself by striking out Cruz Shope and CJ Fernelius. But Seward did not give up. Jordan Kennedy singled and Zane Alexander walked to load the bases. Bercier hit Joe Kuhn with a pitch to force in Tsui and cut the advantage to 12-10. Ward followed by stroking a 1-0 pitch into left field for a single to score Kennedy and Alexander and knot the game at 12-12. Frank Phillips made a pitching change and called on Vaughn Shields to face Benny Ayala. After Shields uncorked a wild pitch to move the runners to second and third, Ayala worked the count full at three balls and two strikes. Ayala came through and flared a single just fair into right field to score Kuhn with the winning run. Ayala and Tsui led the way for the Seward offense with three hits and two RBI apiece. Ward drove in three runs and Fernelius added a two-run homer for the Saints, who had 15 hits in the game. Rene Ramirez (1-2) pitched the final three innings of the game to earn his first win as a Saint. He allowed three runs, one earned, on three hits, struck out two, walked none and hit a batter in the outing. The Saints opened a 4-0 margin in the first inning before the Plainsmen cut the deficit to 4-3 with a run in the second inning and two in the third. Seward scored another run in the fourth to advantage to 5-3. Frank Phillips took a 6-5 lead with a three-run, fifth inning. The Plainsmen scored five more runs over the next two innings and the Saints added four runs in that same span to make the score 11-9. 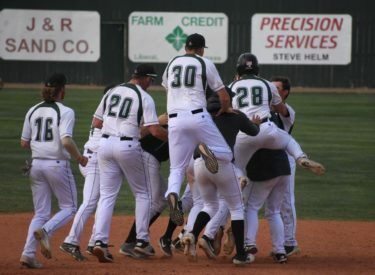 Seward returns to conference play with a big series against Hutchinson, beginning Thursday. The Blue Dragons and the Colby Trojans are tied for first place in the Jayhawk West at 13-7 with the second-place Saints at 15-9, trailing by only two games. Seward travels to Hutchinson for a doubleheader at 1 p.m. on Thursday to start the four-game series. The teams will finish the series in Liberal with a twin bill at 1 p.m. on Saturday at Brent Gould Field.